I only have the link in the previous post. the hobby horse as explanation of the lower right corner makes sense, independent, if the picture or motif indeed was taken from the German source or not. the seventh, a rose; the eighth, a cross moline; the ninth, a double quatrefoil. "In heraldry, a label is a charge resembling the strap crossing the horse’s chest from which pendants are hung." "the label was used to mark the elder son"
"The term mullet or molet refers to a star with straight sides"
"The differences now in use for all families except that of the sovereign may be partially traced to the time of Edward III." The heraldry of southern France, Andorra, Portugal, Spain, and Italy is characterized by a lack of crests, and uniquely shaped shields. Portuguese and Spanish heraldry occasionally introduce words to the shield of arms, a practice disallowed in British heraldry. Latin heraldry is known for extensive use of quartering, because of armorial inheritance via the male and the female lines. Moreover, Italian heraldry is dominated by the Roman Catholic Church, featuring many shields and achievements, most bearing some reference to the Church. French and English heraldry are put in one group, likely cause they have some relationship. If the idea of a correspondece between Sun-Moon-Star and the 3 eldest sons was also used in Italy one can't say from this (Northern Italy hadn't a kingdom as France and England had), but obviously the birth of the oldest son was naturally much more celebrated than that of the second. Roughly one recognizes a sort of Italian model, that the first son became the title-holder, the second a condottiero and the third took function in the church (whereby the order could have been changed occasionally, possibly according the talents, that the sons showed. Sometimes it seems, that the second son wasn't married, before the first has gotten a son, avoiding the situation, that a lower branch might have been older than the first-son-line. 2. 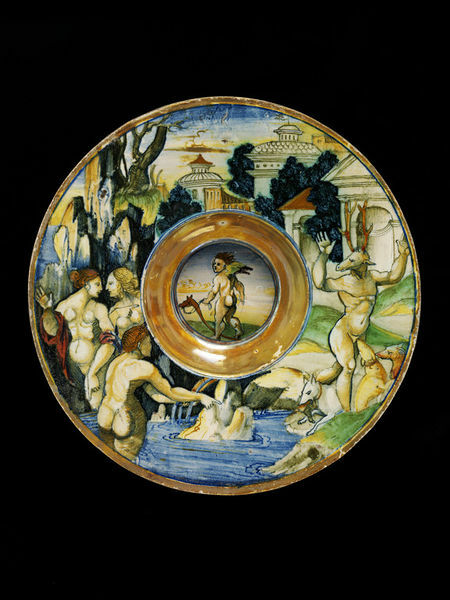 Apollo .... as the "oldest son of Zeus"
... possibly others still to discover? Maybe, that this is far from being complete. 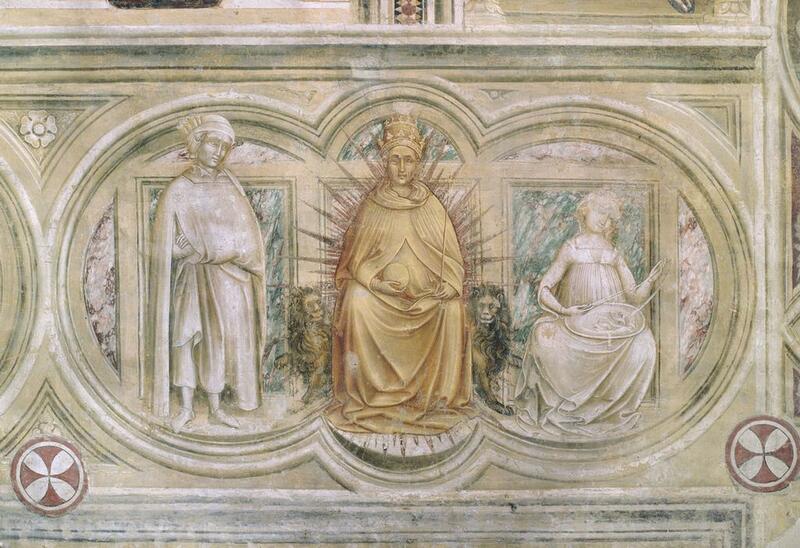 Generally considered it seems, that the idea "Sun" was rather creatively handled. Your reconstruction I think takes a greater account of all the available details, better than that even at Pollett's site, in that it takes into account the pole that in your version becomes the stick of the hobby horse, a very convincing reconstruction. Good point, Steve. I hadn't noticed that. Huck: how do you know that the Germini Sun figures are Artemis and Apollo? Is it a process of elimination, or do you have some positive reason? I did a little digging in my memory. On one horoscope of the time the Gemini are male and female, but they look a little close to be brother and sister (http://1.bp.blogspot.com/_Lu-6PwakMv0/S ... zodiac.JPG).. 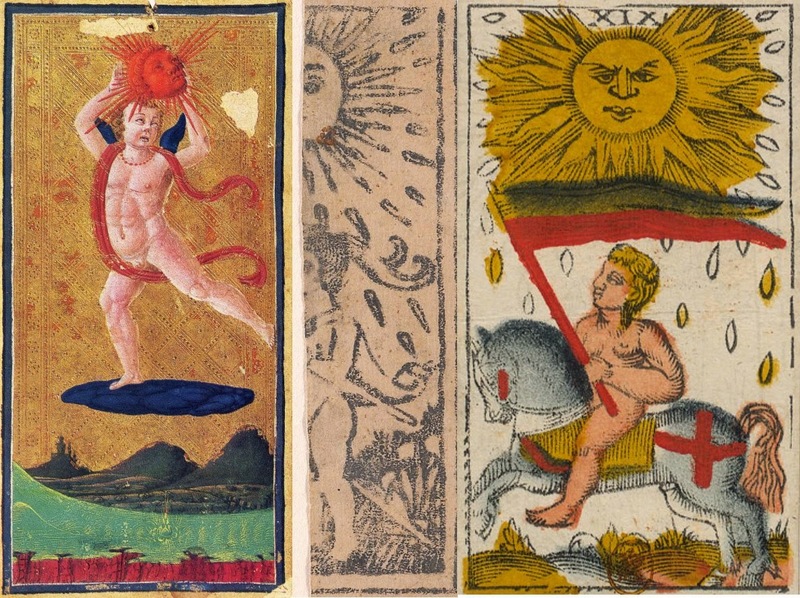 In some literary compositions, especially comedies, we find the expression “far gemini dei tarocchi” (to do the Gemini of tarot), meaning a carnal coupling or an exchange of affection. (Gerozzo. So what do you want me to do? Giannino. That you go into the house while I go to find her, and I will remain with her as agreed: and just before evening you will make the thirty-five of Germini. Gerozzo. What the devil did you say? Giannino. Do not be surprised, if I do not understand your Latin, that you do not understand mine either. Gerozzo. Oh, this is grammar? Giannino. No, sir, indeed it is cypher and here below the most beautiful secret of Maremma. Gerozzo. Do me the grace that I understand it a little. I know that Jupiter and Juno were brother and sister, but that was different. There wasn't anybody else. Did you hear of any children from the union of Apollo and Artemis? Artemis was one of those virgin goddesses, I thought. But this idea of "doing the thirty-five of Germini" might just be something Aretino thought up, I don't know. that got the news from the trumpet. Andrea says that "Rocciolinia" is the Moon; I thought Apollo was the curly-headed one, but if they are twins, why not both? This stanza is not evidence, however; it only says that Rocciolinia was the Moon card in the deck; (different whores were assigned different cards), not that she was the Moon on the Gemini card. So I'm left puzzled. Also, I don't think the Rider-Waite on your list counts, because it derives from Vieville with influence from the Chaldean Oracles (as translated by Westcott) and anyway is not very historic. mikeh wrote: Huck: how do you know that the Germini Sun figures are Artemis and Apollo? Is it a process of elimination, or do you have some positive reason? Thanks, this was a composing error mixed with some wrong memory. I noted it, but did forget to erase the wrong entry. I repaired it. Rider Waite has a boy on a horse. If he took it from Vieville, that's okay, cause Vieville is also on the list. Interesting colorful pictures are at this page. Also, I don't think the Rider-Waite on your list counts, because it derives from Vieville with influence from the Chaldean Oracles (as translated by Westcott) and anyway is not very historic. He got it from Levi, who in Trancendental Magic described the 'naked child on a white horse with a scarlet banner' as a variation of the Sun card (most probably the Vieville). To check what is here advanced, the reader may consult the commentary of Psellus on the doctrine of the ancient Assyrians: it may be found in the work of Franciscus Patricius on Philosophical Magic, p.24 of the Hamburg edition, which appeared in 1593. Waite in his notes references the translation by G. R. S. Mead., the translation by Thomas Taylor & J. Kroll’s De Oraculis Chaldaicis, Breslau 1894. 5. The physicists on the other hand produce strong evidence for his divinity. For there are some who identify Janus with Apollo and Diana and maintain that he combines in himself the divine attributes of both. 6. Indeed, as Nigidius, too, relates, Apollo is worshipped among the Greeks under the name of “the God of the Door” (Thyraios), and they pay honors at altars to him before their doors, showing thereby that he has power over their going out and their coming in. Among the Greeks Apollo is also called “the Guardian of the Streets” (Aguieus), as presiding over the streets of a city (for in Greece the streets within a city’s baoundaries are called aguiai); and to Diana, as Trivia, is assigned the rule over all roads. 7. At Rome all doorways are under the charge of Janus, as is evident from his name which is the Latin equivalent of the Greek Thyraios; and he is represented as carrying a key and a rod, as the keeper of all doors and a guide on every road. 8. Nigidius declared that Apollo is Janus and that Diana is Jana, that is to say, Jana (iana) with the addition of the letter “D,” which is often added to the letter “I” for the sake of euphony (as, for example, in such words as reditur, redhibetur, redintegratur, and the like). 9. Some are of the opinion that Janus represents the sun and that his two faces (geminus) suggest his lordship over each of the two heavenly gates, since the sun’s rising opens and his setting closes the day. The fact that men call on the name of Janus first when any god is worshipped is held to indicate that it is through him that access may be had to the god to whom the sacrifice is being made, and that it is as it were through his doors that he suffers the prayers of suppliants to pass to the gods. 10. Again, it is as marking his connection with the sun that an image of Janus commonly shows him expressing the number three hundred with his right hand and sixty five with his left; for these numbers point to the measure of a year, and it is a special function of the sun to determine this measure. * Folengo's Janus makes reference to the City of Apollo with its high walls, stars, sun, moon, tower (along the lines of the Tower of Babel), world, Janus as a man of 'single-face' harrased by dogs, as a man with long white beard as a figure of 'Time', the poet himself as a madman, foolish person, the theme of the choice between two roads, and virtues and fama. 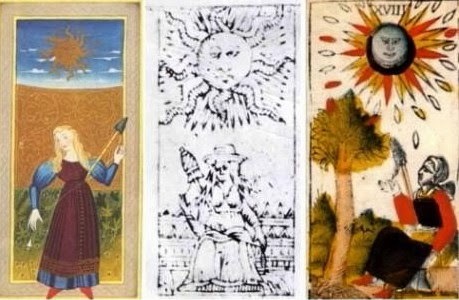 Probably any relation to tarot trumps is coincidental, but given his Tarocchi Appropriati sonnets, his connection with the Gonzaga/d'Este court (members of which family are addressed in the poem), and tarocchi appropriati being associated with that court, possibly not.